December Sun International Co. Ltd.
December Sun International Co. Ltd. – Supplier of ceramic houseware items including tableware, kitchenware, and decorative pieces. Taiwan. 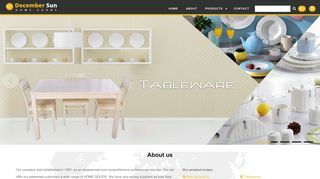 – Supplier of ceramic houseware items including tableware, kitchenware, and decorative pieces. Taiwan.